Shapes by Kira Release of Eva Skins! You are invited September 25th to Shapes by Kira for the debut of the fabulous new Eva skin. Gone are the days where you find a gorgeous shape and then have to search high and low for just the right skin to match it perfectly. Shapes by Kira is very well known for creating beautiful shapes and now with the release of Eva skin you can let Shapes by Kira be your one stop body shop. Eva skin comes with and without a hair base and looks great with a variety of shapes found at Shapes by Kira. Eva comes with 9 makeups and one natural look and for you freckle lovers next month there will be a freckled version of Eva released. Eva skin will also be featured at the skin fair being held September 26th until October 10th. There will be an exclusive makeup found only at the Expo (The expo will help raise money in support of the Susan G. Komen for the Cure Foundation). You definitely want to make it to the skin fair in order to check out that amazing exclusive! The talented person behind Shapes by Kira is Kira Paderborn. Kira was one of the first models at Avenue Models when it opened and she quickly showed she was more than just another 'pretty face'. Two and a half years ago Kira noticed there were not many shape makers in Second Life. She began making shapes and even though her shop was small her clientele grew rapidly, and Shapes by Kira became an overnight success. Kira is also a co-owner of the Corrupted Innocence brand along with her business partner Alexxis Laszlo. Second Life is full of many people who make skin and shapes but Kira truly believes in putting out only quality material. There is nothing in her stores that she herself would not wear. Months ago Kira made a skin and sent it to bloggers. She got lots of feedback on that skin after its release and decided to create a new skin making changes to improve the overall quality of the skin and make it more appealing to potential customers. Kira puts her heart and soul into each item she creates and hopes her customers can feel that when they wear something created by her. Looking good and feeling good begins underneath your clothes. Let Shapes by Kira help you feel and look your best! For more information regarding Shapes by Kira, please contact Kira Paderborn-Owner. Media wanting to interview or setup appointment with Kira, please contact Annette Wilder-Wilder Public Relations Firm Inc™ Owner. Come and see new fall fashions! 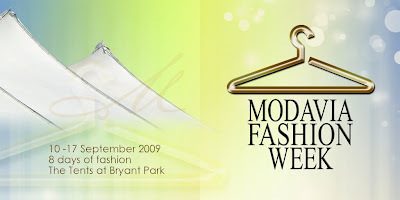 September 14, 2009 - Modavia Fashion Marketing today announced plans for the next Designer Wardrobe Giveaway presentation to coincide with the Modavia Fashion Week event taking place September 10-17. The Giveaway is a regular monthly drawing that rewards one lucky subscriber to the Modavia Fashion Directory with a free designer wardrobe containing up to 45 couture outfits. During the course of Fashion Week subscribers have been invited to visit Bryant Park, the venue for Modavia Fashion Week, and enter the drawing. Two winners will be announced immediately after the final show which will take place at 4pm on the 17th September. A total of 90 designs from 40 of the top couturiers in Second Life will be given away together with all the artwork contained in the last 2 editions of the Directory, that is, the 10th and 11th edition. To avoid congestion on the sim winners will not be required to be present at the drawing but will be required to make themselves available for photographs within a week of the prize being awarded. Anyone can enter the Giveaway drawing providing they are current subscribers to the Modavia Fashion Directory. 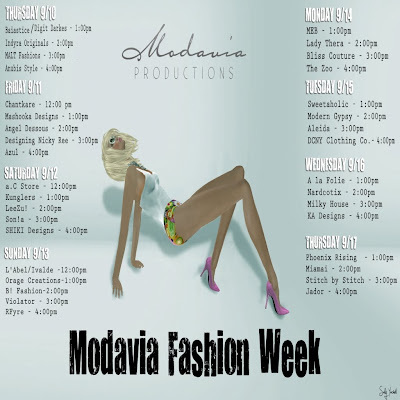 This contest is not open to staff, models, clients, sponsors or suppliers of Modavia. There are kiosks for signup located at many fashion retailers throughout Second Life, at the Modavia Headquaters and at Bryant Park during Fashion Week. The newly refurbished and relocated Club Velvet manor will sponsor its first fashion show on it’s own sim. The club is spotlighting the designers from all of their Boutiques located in the Atrium of Club Velvet Manor. Official invitation is as follows. It’s a night to shine for our Velvet Manor designers as we roll out the red carpet Hollywood Style. Come see the latest in fashions and accessories for the fall in glamorous glitzy style. Entertainment will be in abundance. So come walk the red carpet in our Hollywood inspired atmosphere, witness the crowning of the new Miss Velvet Manor, participate in our cash contest, and more while our designers roll out their finest. After party in the main Club at 5:00 PM until ? Did you know that 20% of SL residents have some kind of disability? Are you reaching this market with the fashions you create and your store layout? 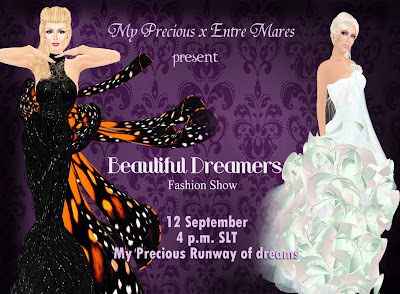 The audience for this class includes SL fashion designers as well as store owners in SL of any type. Join Gentle Heron and Eme Capalini from Virtual Ability for an informative session that will challenge and enlighten fashion designers and store owners. Both are experts in SL disability issues.